Posted February 26, 2014 by Josette Farrell in News. 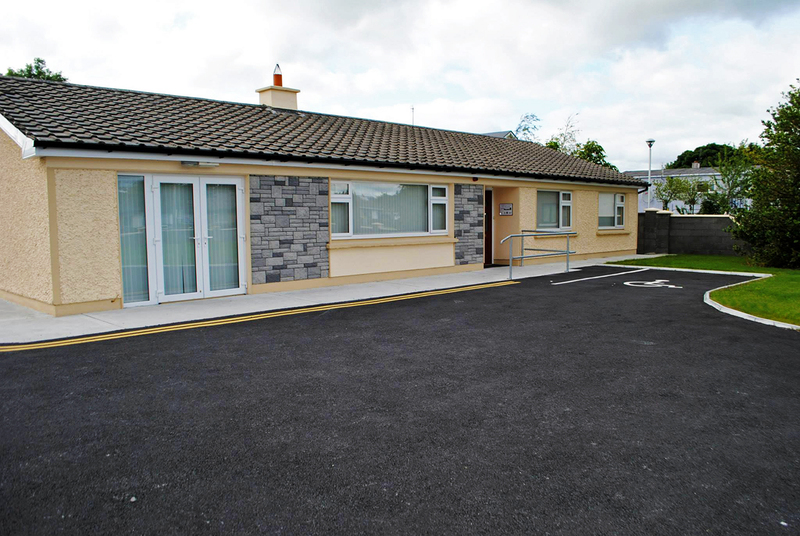 The Claregalway & District Day Care Centre (CDDCC) has been shortlisted as a finalist in the Day Care Centre category in the 2014 Irish Healthcare Awards, which takes place on Friday March 7th in Dublin. The centre began in October 2012 and provides a service to the elderly, to isolated community members and those with early dementia or other ailments that limit their social interaction. Initially, the centre opened for three days a week. It now runs four days a week and is aiming to open five days a week in spring. 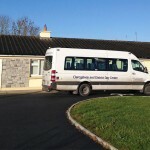 The centre caters for 17 attendees a day and covers a catchment area of approximately ten kilometres from the centre of Claregalway village. 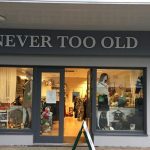 The centre depends on its dedicated volunteers, including retired nurses, relevant FETAC qualification holders, general helpers and volunteers who come in and do various arts, crafts, activities, board games etc with the attendees. A food health professional attends on a regular basis and the centre plans to provide further services such a physiotherapy, talks on nutrition, safety in the home and various other subjects. All meals are provided to those who attend and local national schools provide music, song and dance on occasions. A computer room is available if anyone has an interest in learning computer skills. The centre also provides a hygiene and laundry service to those who want it. 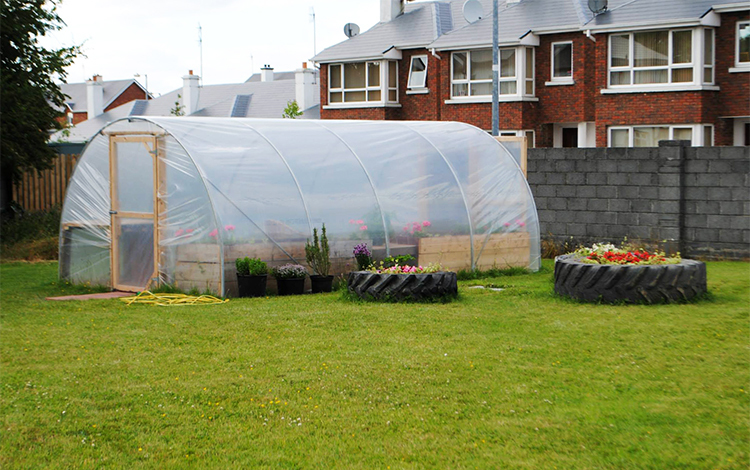 A polytunnel was donated last year (pictured below) and attendees enjoy going into the garden. Last year the centre received a wheelchair accessible minibus which was funded by the National Lottery and Galway Co Council. The bus collects clients from their homes and returns them at the end of each day. Day trips have also been organised to Knock, Bunratty Castle and Kylemore Abbey. Tom McCann, Clinical Nurse Specialist, HSE says, “The CDDCC has the reputation of being a wonderful, warm, inviting place to be, not only because of the pleasant environment but also because of the people. We receive many requests to visit the centre from other groups who have heard about us and are thinking of opening a similar facility within their own districts. “Within the 18-month period the centre has just gone from strength to strength. Future plans will include extension of the service to meet the needs of the increasing ageing population of the area. The CDDCC are very grateful for the support and funding received from the HSE, St Vincent de Paul, Galway County Council, Galway County VEC and Galway Rural Development. 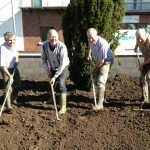 Check out our photo album of the development of the Claregalway & District Day Care Centre here. 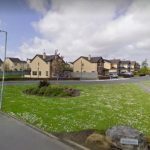 New Housing Scheme for elderly in Claregalway. 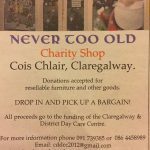 Never Too Old Charity Shop, Claregalway.